When Sedna was discovered in 2003 it was regarded by many as an outlier, nothing else like it was known in the Solar System. Fifteen years later, at least 28 objects are known to follow paths similar to that of Sedna. The orbits of these objects are still puzzling and they might be signaling the presence of a massive perturber well beyond Neptune. Slowly but steadily, new data are being obtained, and the orbits and physical properties of some of these 28 extreme trans-Neptunian objects or ETNOs are now better known. It has not been easy, the orbits of the members of this group of extraordinary asteroids are larger than those of other previously known objects and they never cross the orbit of Neptune. They are always distant targets, only accessible to the largest and most sensitive telescopes available today. Among the 28 known ETNOs, a few follow similar orbits. Speaking of orbital similarity, we have to consider size, shape, and orientation in space. The overall orientation in space of their trajectories can be described in terms of two points, the pole, and the perihelion. The pole is perpendicular to the plane of the orbit; the perihelion point on the orbit is the closest to the Sun. Orbits are similar when they have comparable sizes and shapes, and their respective poles and perihelia are relatively close, just some degrees away from each other. We have studied this topic for the 28 known ETNOs and just three pairs exhibit a statistically significant degree of dynamical correlation in terms of orientation in space: 2013 FT28 and 2015 KG163, (474640) 2004 VN112 and 2013 RF98, and 2002 GB32 and (506479) 2003 HB57. Only the last two pairs have orbits of similar size, shape, and orientation. Although the orbits of the first pair have very similar orientations, their sizes are quite different. Orbital similarity opens the door to a past relationship. Confirming that a pair of asteroids could be related is difficult. First, we have the similarity of the orbits, but the physical properties of the objects must be consistent too. If one of the objects is very red in color and the other is very blue, even if they follow similar paths, they may not have a common genetic origin. The color of an object can be studied using photometric observations, but spectroscopy produces more reliable results and it provides information about the chemical composition of the surface of the object as well. Two objects with a compatible chemical composition that move in similar orbits may have a physical connection. The two objects could be fragments of a larger body or be the former components of a binary system, two asteroids that were formed together orbiting a common center of masses. Splitting an asteroid in the region of the outer Solar System commonly traversed by the ETNOs is not easy. A direct collision is unlikely, the density of material is very low out there; the asteroidal Yarkovsky-O’Keefe-Radzievskii-Paddack (YORP) effect which is the main cause of splitting in the main asteroid belt and the near-Earth space does not work so far from the Sun. Binary dissociation is more likely if there are binaries and they are interacting with a sufficiently massive perturber. There, we confirm that a pair like (474640) 2004 VN112-2013 RF98 could have arisen from the disruption of a former binary if it experienced an interaction with a planetary body. Our results indicate that a planet with a mass in the range 10–20 Earth masses moving in a moderately eccentric (0.1–0.4) and inclined (20–50 degrees) orbit with semi-major axis of 300–600 AU, may be able to trigger the dissociation of a binary ETNO following an orbit like those of the pair of ETNOs (474640) 2004 VN112-2013 RF98. Such a planet may have eluded discovery for so long if it is currently moving towards the Clouds of Sagittarius, where few surveys dare to observe. In fact, some of our favored orbital solutions for the perturber place it there. The pair (474640) 2004 VN112-2013 RF98 is not only relevant because of their orbits, but in terms of chemical composition as well. Our spectroscopic study entitled “Visible spectra of (474640) 2004 VN112-2013 RF98 with OSIRIS at the 10.4 m GTC: evidence for binary dissociation near aphelion among the extreme trans-Neptunian objects” shows that their surfaces must be very similar. 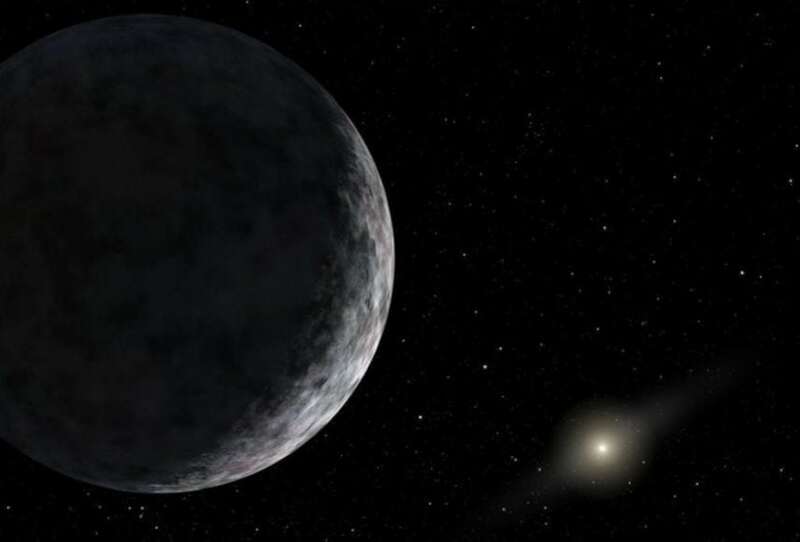 These findings are described in the article entitled “Binary stripping as a plausible origin of correlated pairs of extreme trans-Neptunian objects,” published in the journal Astrophysics and Space Science. This work was led by Carlos de la Fuente Marcos from the Universidad Complutense de Madrid. C. de la Fuente Marcos is a PhD is astrophysics and astronomy at Universidad Complutense de Madrid.